Histology. The testis shows diffuse hemorrhagic necrosis involving the entire parenchyma. Discussion: Torsion of the testis occurs as a result of the testis rotating on its axis and compressing the blood supply of from the spermatic cord. The clinical presentation is of acute scrotal pain. In children, the main symptom could be abdominal pain (referred pain to the abdomen), which could lead to a delay in the diagnosis due to lack of examination of the genitalia. If attempts to reverse the torsion are unsuccessful, the management is orchiectomy. 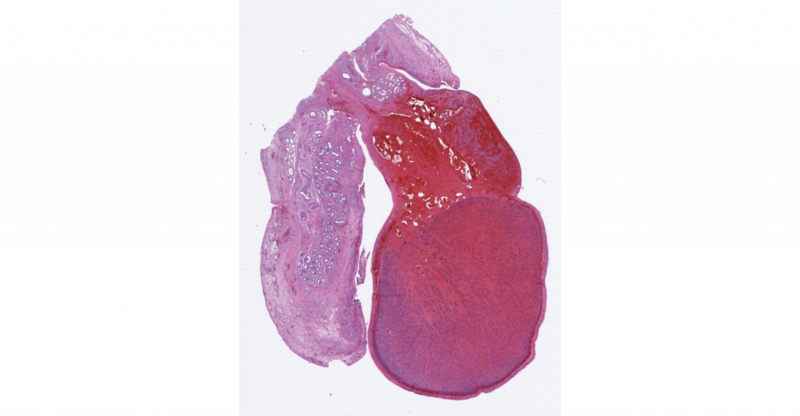 Histologically, the main differential is with vasculitis, in which specific vessels are affected by inflammation and a segment of the testicular parenchyma will be affected. In contrast to torsion, in vasculitis there is a sharp demarcation between the area of necrosis and vital parenchyma. In the initial phases of torsion, the parenchyma is diffusely hemorrhagic and undergoing necrosis, some of the seminiferous tubules may still appear vital. After 24 hours, the picture is of diffuse necrosis and the predominant picture is of ghost cells with the shape of seminiferous tubules (coagulative necrosis). Acute inflammation can be seen as a response to ischemia and should not be considered infectious orchitis. Differential diagnoses in Surgical Pathology. Johnathan Epstein and George Netto. Chapter 4. Testis.